Pictures of the prehistoric petroglyphs, rock carvings, of the Foppi di Nadro area of the Riserva Naturale Incisioni Rupestri di Ceto, Cimbergo e Paspardo, in the Valle Carmonica, Lombardy Italy. The Riserva Naturale Incisioni Rupestri is a large area of wooded hill side with over 420 rock surfaces covered with prehistoric rock carvings. The prehistoric rock carvings of the Val Camonica in northern Italy are the largest collection of prehistoric petroglyphs in the world. An incredible 200,000 to 300,000 prehistoric petroglyphs have been found in the Val Camonica and several archaeological sites protect concentrations of the rock carvings.The Riserva Naturale Incisioni Rupestri di Ceto, Cimbergo e Paspardo, protects 3 areas of petroglyphs one of which is the Foppi di Nadro area overlooking Capo di Ponte in the Val Camonica. The prehistoric rock drawings date from about 8000 BC and examples of Roman and medieval rock carvings can be found. 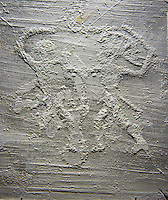 The biggest concentration of rock art is from the Copper Age, 3,200 - 1,600 BC and the Iron age 1,600 - 900 BC. The prehistoric petroglyphs of the Valcominica in Italy were designated as UNESCO World Heritage Sites in 1979 due to their “ extraordinary figurative documentation of prehistoric customs and mentality. The systematic interpretation, typological classification, and the chronological study of these configurations in stone represent a considerable contribution to the fields of prehistory, sociology and ethnology”. The petroglyphs were made by striking the rock surface with another sharp rock creating small cup shaped incisions that were joined together to make a depiction. The petroglyphs of the last period are attributed to the people of Camunni, a tribe that was conquered by the Romans in the late Iron Age. 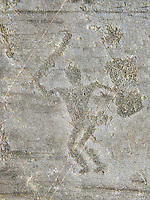 The Camunni were fanatical rock artists as the number of rock carvings in Valcamonica demonstrates. 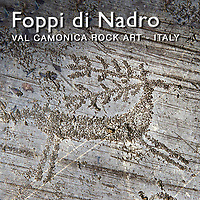 There are recurring themes though and the prehistoric petroglyphs of the Foppi di Nadro area of the Naturale Incisioni Rupestri depict scenes connected to agriculture, deer hunting, duels, as well as geometric-symbolic figures. Whole villages with two storey houses raised on poles are laid out in what may be maps of territorial areas. Agricultural scenes depict the early use of ploughs. Fighting scenes show the type of weapons in use as well as armour and shield types used by the Camuni. 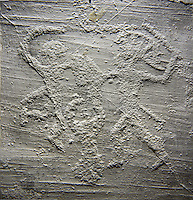 There are many iconic petroglyphic scenes at the Foppi di Nadro area including what seem to be warriors boxing as well as warriors with elaborate headdresses and some that look like spacemen with halo helmets. Amongst the geometric rock carvings if the “Camunian rose” that is used as the emblem of Lombardy. Download pictures of prehistoric petroglyphs, rock carvings, of the Foppi di Nadro area of the Riserva Naturale Incisioni Rupestri as stock photos or buy as photo wall art prints on line.